A mesenteric cyst is defined as any cyst that is located in the mesentery and may or may not extend into the retroperitoneum; histologically, the inner surface of the cystic wall presents a recognizable lining of epithelium (cuboidal/columnar), endothelial or mesothelial, depending on the embryologic origin of the cyst. According to this definition, intestinal duplications, being most commonly cystic and located on the mesenteric aspect of the small or large intestine, may be part of this group. However, we will consider them in this chapter only for the differential diagnosis. 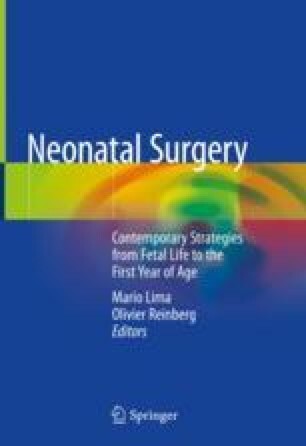 Furthermore, in this chapter we will only consider cysts that interest the neonatal or infancy period, that is, the congenital ones. In older children and adults, other cysts of an acquired nature do exist. These have an infectious (e.g. hydatid cyst) and neoplastic (e.g. teratoma) etiology and are excluded from this context. Saxena AK. Mesenteric and omental cysts in children. https://emedicine.medscape.com/article/938463-overview.